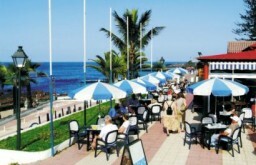 Puerto de la Cruz is in the north of the island of Tenerife and one of the area’s most popular resorts. The resort attracts thousands of tourists every year and is distinctly Canarian in character. It is about an hour’s drive from the main Reine Sofia airport because it is in the far north of Tenerife. Puerto de la Cruz is generally regarded as a sophisticated holiday resort; it has a stylish garden beach and a fine selection of top class restaurants. In the summer months the resort is a favourite with the Spanish who go for the upmarket shopping and a stroll along the elegant plazas and streets. Puerto de la Cruz has less rainfall than most of the north of Tenerife but there is sufficient to keep its lush grass, plants and trees thriving. The climate is wonderful rising from the low twenties in winter to the high twenties and early thirties in summer. The resort was originally a port where the wealthy of the island gathered, the harbour is still quite busy with the fishing boats either bobbing on sparkling blue waters or berthed on the pebbled shore. There are food stalls lining the streets around the harbour where visitors can buy freshly cooked fish and traditional Canary Island delicacies. The fair comes twice a year to the resort area and the circus comes once, in July there is a carnival and fiestas and the harbour area is filled with stalls selling food and drinks. Even golfers are catered for in this resort as just outside the town there is a nine hole golf course. There is a lot to see and do in Puerto de la Cruz as it is one of Tenerife’s more established resorts. The beautiful Playa Jardin or garden beach is just one kilometre of fine black sand and sparkling blue waters. The beach is called the garden beach because at its back are extensive lush gardens, including a cactus garden. Also on the beach are a self service restaurant as well as toilets and changing facilities. The island is full of hotels, apartment blocks and holiday villas. There are plenty of pavement cafes and top class restaurants as well as bars and clubs. The night life in Puerto de la Cruz is varied, you can have a peaceful stroll and a late drink or you can dance the night away in one of the clubs. The Forum is a corner bar with candlelit tables set up outside for people to enjoy the balmy evenings. The resort has its fair share of British and German bars and clubs but drunkenness is not really part of the culture. For many people the evening doesn’t really begin until after midnight at weekends. People socialise and may later dance to a Latino band. The resort also has more than its fair share of night clubs, although most of them don’t get going until after 1.30 am and there is usually a fee to be paid at the door. The Tenerife Palace is a popular venue for Broadway shows and musicals so the resort of Puerto de la Cruz has something for everyone.